Last week was the 40th anniversary of Lennon not only being on sale again but up on stage for possibly the last time. I say possibly because those present at the Tribute to Lord Lew Grade (he of ATV and Sinking The Atlantic fame) in April 1975 might protest that their thunder was bushwhacked. Whichever or whatever the definitive moment was, there's no doubt it was still a triumph. Lennon is for every day, not just for Thanksgiving. But I'm not going to look at the moment at this time. EJ.com have done some great articles on that moment from those who were there so the eyewitness reports are quite sufficient. What I want to zoom in on is Lennon's studio collaborations with Elton. I had Sgt Pepper on the other day and it's impact still seeps through the speakers. No wonder Brian Wilson nearly crashed his car on first hearing of it on the radio which led in some small part to his retreat from the world following his failure to bring his 'Smile' project to fruition. He knew at that very moment his task of topping the Lonely Hearts Club band effort would be futile. The 1967 version of Lucy was recorded pretty quickly, one night for the rhythm track and another night for the overdubs. Recorded on cutting edge (at the time) equipment that rapidly became out dated at decades ends. But that still doesn't temper it's influence. The surreal imagery...too 'out there man' even for this blogger to decipher! But the catchy chorus needs no explanation. Lennon's vocal is quite tinny at times, the half here, half there spirit he evokes from it is another example of its detachedness from our reality. McCartney's bass at the end is his usual style of rhythmic punch. Jump forward seven years...in fact we've headed at Warp 7 into the future. Because recording techniques at this time had taken the same leap of light speed. Elton's version is bolder, brighter, bigger and beautiful. The longer intro with bells on...quite literally from Ray... immediately grabs a vital tribute from the original version. Davey on Leslie guitar is centrally located to spread some familiar soundscapes. The 'Caribou' sound of the drums, all points focused and lively are in evidence. Nigel's big fills could only be dreamed about in 1967. 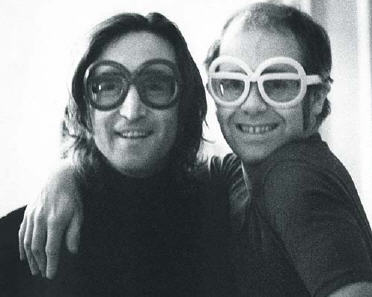 Elton's vocal is more adventurous than Lennon's was. His lively harmonies are terrific. Lennon's vocal is heard on the chorus but his distinctive (at times) snarl is clearly heard. Elton's great skill at arranging is sometimes overlooked, but his interweaving of Mellotron especially with other keyboards is carefully and tastefully done. A massive sound is generated, again the Old '67ers would be jealous. One Day (At A Time) was another that got the 'Elton' treatment and was all the better for it. Lennon's 'Mind Games' version suffers from a lack of proper production input. Produced by himself it shows what a great song it is but nothing more. Country tinged due to Sneaky Pete's involvement and the reverby drums being stroked by light brushes. However when Gus got his able producing hands on it, a greater event came to fruition. Elton's electric piano work...always a great favourite here...bounces like a ping pong from left to right in the spectrum. Davey takes the motif that flowed through the original to another level. Takes it to the front in fact. His gorgeous guitar work, sassy and sultry, is ably backed up by bright acoustic piano. String synth adds some glorious washes of sound, the solo part is like a workout of symmetry and harmony. Nigel's delicate yet definite drumming is bristling full of bounce. Elton took two masterclass works of songwriting and turned one on it's head and accentuated the positive in the other. They say you shouldn't do covers but in these cases, for differing reasons, these both work...even better than the real thing. Miley take note...it was already done and done...better.